Row houses in the Hampden neighborhood of Baltimore show off Christmas decorations on Dec. 6, 2017. Known as "The Miracle on 34th Street," the dramatically over-the-top decor along the block is perhaps Baltimore's most beloved seasonal institution, attracting thousands of onlookers each December. From kitschy ornaments to model train extravaganzas and a holiday song dedicated to bottom-feeding crustaceans, Baltimore's unique brand of quirky creativity really shines at Christmas. For moviemaker John Waters, the city's favorite offbeat son, the Yuletide season offers up a parade of unconventional delights. The pop-culture icon dubbed the "Pope of Trash" tours the country with a one-man show devoted to Christmas themes and decorates the front door of his Baltimore home with a thorny wreath to snag guests' clothes. Waters loops lights around an electric chair featured in his outrageous comedy "Female Trouble" and sticks unflattering photos of loved ones on tree decorations. "I like it (Christmas) because it's excessive, it's crazy, you can't ignore it, and it makes people nuts,'' said the director of the underground classic "Pink Flamingos" and the acclaimed-comedy-turned-Broadway-hit "Hairspray." While Baltimoreans enjoy "The Nutcracker" and other noel classics, there's no shortage of natives who tweak festivities with some of their hometown's enduring eccentricities. Wrapped around a cove of the Chesapeake Bay, Baltimore has its own seasonal carol paying homage to its favorite delicacy. David DeBoy wrote "Crabs for Christmas" in 1981 and more than 35 years later, it's become a holiday staple. While some snicker at the title, he swears it's about seafood. The song tells the story of a "big fella" from Maryland who finds himself in Texas at Christmas time. Perched on Santa's knee at a department store, he pines for a Baltimore feast: "Oh, I want crabs for Christmas/ Oh, only crabs will do/Oh ho, with crabs for Christmas/My Christmas wish'll come true." DeBoy said Christmas in Baltimore has its own unique expression because, well, Baltimoreans are often a unique sort. "They're very proud of who they are. Yeah, they're quirky, but they're proudly individual and they're just fine with that," said DeBoy, who has written other Baltimore-specific holiday tunes like the doo-wop "Christmas on the Stoop," which details seasonal obligations such as stringing tinsel through window burglar bars. 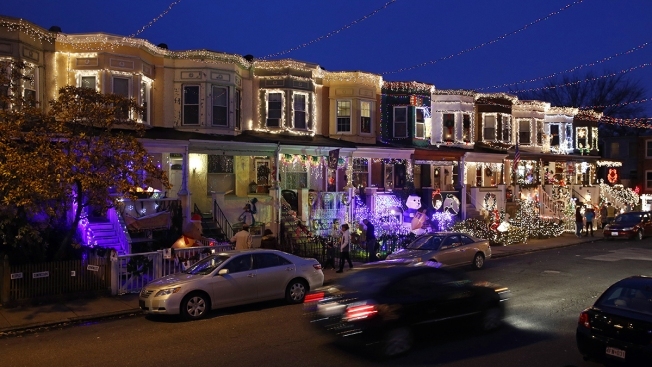 In Baltimore's Hampden neighborhood, an explosion of multicolored lights, glittering snowmen and designs of Maryland's beloved crabs line a block of row houses. Known as "The Miracle on 34th Street," the over-the-top Christmas decor is perhaps the city's most beloved seasonal institution, attracting thousands each December. It's now in its 71st year. "This is just neighbors coming together. It's 100 percent Baltimore," said resident Shacara Waithe, across the street from a yard dominated by a Christmas tree made entirely of hubcaps and ornaments fashioned from cartons of Old Bay seafood seasoning. The oldest Baltimore-area holiday custom is "Christmas Gardens," which has roots in its 19th-century German immigrant community. The "train gardens" are a fading tradition, but some firehouses still set up the imaginative displays of model trains chugging past fantastical townscapes that firefighters spend months planning and assembling each year. Each year, the mayor's annual Christmas parade includes nods to some of Baltimore's idiosyncratic customs, including women dubbed "hons" - in honor of a ubiquitous term of endearment - in cat-eye glasses and beehive hairdos, as well as a handful of vendors known as "arabbers," mostly African-American men, who sell fruits and vegetables from painted horse-drawn carts. Waters' annual 70-minute monologue called "A John Waters Christmas," wrapping up an 18-city tour this month, includes anecdotes of Christmases past in Baltimore and pep talks about what to do if you're forced to participate in a living Nativity scene against your will. In his 1920s-era Baltimore house on a recent afternoon, Waters brainstormed new images for a popular projector device he loathes that illuminates holiday scenes on homes. "I would like to design like a really hideous one - Santa screaming or something,'' Waters told The Associated Press with a chuckle. He was decked out in a red velvet jacket over a black turtleneck and sporting his trademark pencil mustache. Dean Krimmel, a historian and 55-year resident of Baltimore, suggested that Baltimoreans are not necessarily quirkier than people elsewhere, they just happen to be more comfortable sharing, celebrating and promoting their eccentricities. "What others now call eccentric and pay good money to experience when they visit us, read about us, watch movies about us, even buy tickets on Broadway for a glimpse into our quirky lives, well, we call that our inheritance. Our 'value-added' in an increasingly homogenized world," Krimmel said in an email.